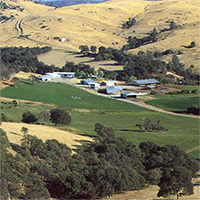 Located in Northern California's foothills, 60 miles northeast of Sacramento, the Sierra Foothill REC is one of nine agricultural research and extension center in the Golden State administered by the University of California, Agriculture & Natural Resources. It provides land, labor, facilities and management for agricultural research and assists in public education in matters relating to agriculture. The Center's vision is to serve as a national and international center for research, extension, and teaching related to the supervision, stewardship, and function of Mediterranean woodland ecosystems, particularly as managed to produce a spectrum of benefits to society.